The final chapter of China had begun. 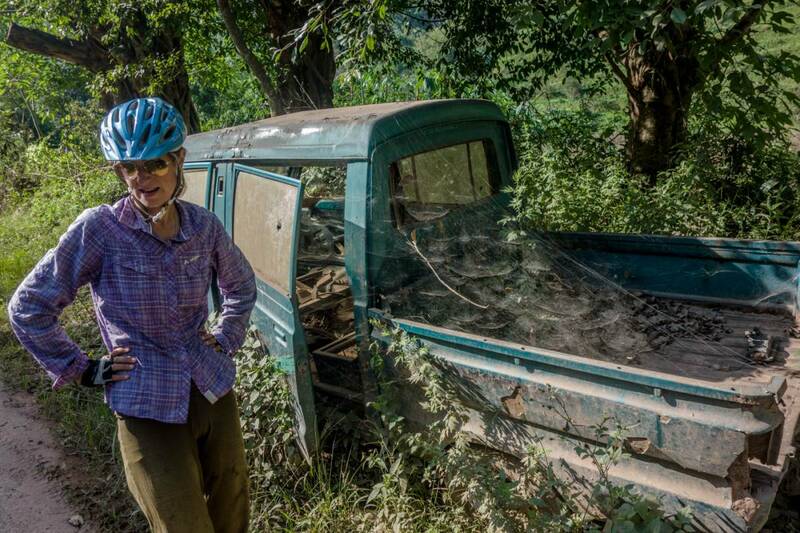 We were cycling from Lijiang through Yunnan province to the border with Laos. We were at lower altitude and it was getting more warm and humid. We were looking forward to different food, different scenery and meeting more travellers on the road. 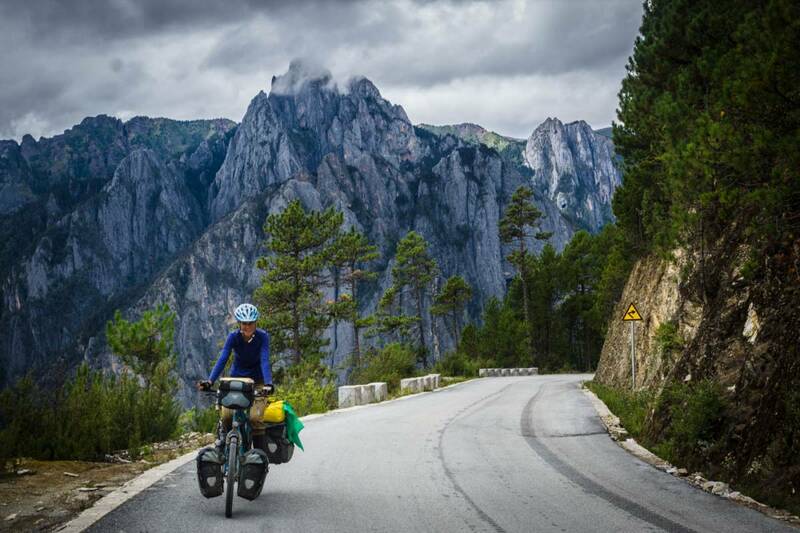 Yunnan a tropical endeavour and a finale of bicycle touring in China. The photos of Yunnan are here: Lijiang to Weishan, Weishan to Puwenshen and Xishuangbanna and the Mekong. Together with Italian cyclist Davide we left Lijiang via the small road to Dali. We had discussed our plans and thought of different itineraries but were ready to just head south without too much detouring. The road was smooth and easy going and had a small pass on top of which we slept. The following morning was a beautiful morning Davide wanted to wait till the sun would dry his tent. We started of easy going and expected Davide to catch up with us. However somewhere we had missed each other and after waiting a few times we decided to head on further towards Dali. We had a nice lunch along Erhai lake and rode into Dali around three o’clock to find Davide in the hostel we had agreed to stay in. He had arrived two hours before us because he was speeding and we were taking it slow! We decided to stay at Mila’s Heim next to the 5 elements hostel because it was quiet and they gave us a good price for the room. We visited the bar Bad Monkey where Martin and Davide had a guy’s night out which included quite a few beers and definitely had an impact the next day. We enjoyed the banana and chocolate pancakes at the Blue Gekko and really had the feeling of being on the backpacker trail. Dali was a perfect place for us for a little bit more rest, eat some western food and enjoy conversing with fellow travellers. We went for dinner with a two Israelian couples and met with Alex and Simon, travelling from Europe and who had cycled from Xining to Lijiang. We had found a note on our bikes exclaiming that they had ‘found us’, while we didn’t know people were looking for us. They had seen our bicycles in Litang but we never actually met although they emailed us, which had gotten stuck in the system somewhere. It was nice to share some cycling stories. From Dali we were all by ourselves again because Davide had already left for Kunming (where on the way his bicycle got stolen 🙁 ). We headed south through Weishan, another town with an old city, although in this case almost without tourist and tried to find a place to camp. This evening and a few more to follow was really difficult because people were everywhere and the land was in use in many places with growing crops. We passed a small hotel on the road and convinced the owner to let us stay, which is not always easy with the Chinese registration policy (and we had already received a no at a previous small hotel on the road). The road went on and we knew that on this stretch almost everyday we would have a small pass of a few hundred meters. Yunnan is beautiful cycling but it is hilly! 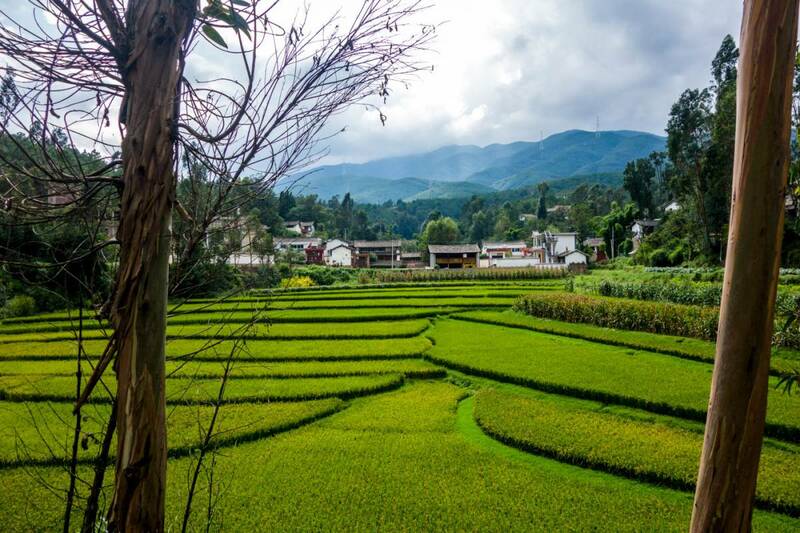 The smaller cities we passed, such as Ninjian and Jingdong were very Chinese, but the villages remained nice with rice fields and more and more tropical plants. We followed the S222 until Zhenyuan following the river and going up and down. From here we followed a smaller road on the map which actually was quite a busy road with good asphalt but many honking horns, cars and small trucks passing us in a not always smart driving style. It is definitely easier for Chinese to honk their horn then drive their car in a proper way. The weather was not so steady and we felt at times that rainy season was at its peak with showers that could soak us in minutes. One evening we were saved from the rain by a small guesthouse where corn was being dried in the courtyard. In this area fields with tea plants and coffee plants covered the hills and it was a beautiful sight, although it must also impact the earth quite a bit. We have also seen quite a bit of Tobacco plants which you can also smell and China Tobacco has a few factories in the area. 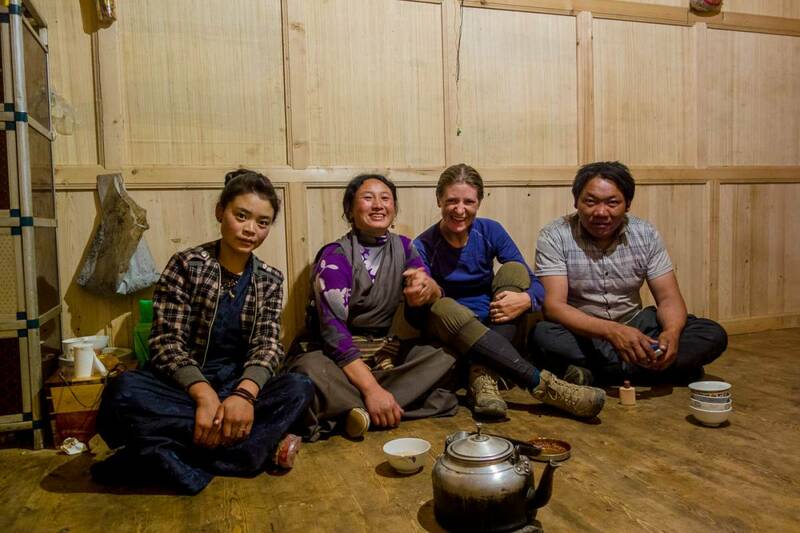 Just before Ning’er there was another small pass and again it was hard to find a place to sleep. It was close to dark when we had made it to the top of the pass. We descended down the other side and asked at a restaurant if they would have a place for us to sleep. They were very inviting and had a small room. The restaurant family had prepared a dinner for family and friends and straight away we were invited to join and eat. The dinner was probably arranged because of the October holidays. After dinner some of the family went to the play room where they had a table set up with Mahjong playing stones and they started playing each other in a very practiced way and money went from one side of the table to another. It was visible that this was a game they had played since they had been very young. We passed Ning’er and Pu’er, famous for the Pu’er tea. We had planned to stay in Pu’er for the night but it wasn’t really the inviting city which we had expected so we pushed on and eventually stayed in Puwen, which was quite a nice little town. We had passed many many fields with banana trees, had seen papaya hanging in a tree, a few fields with cacti with dragonfruit and other fruit we don’t know the names of. It was moist, we were sweating and the sun was shining fiercely now and then. 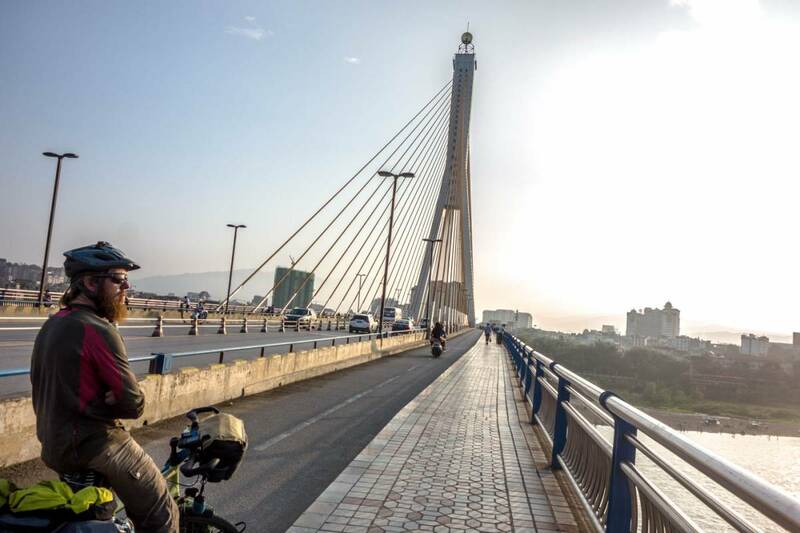 It was a special moment for us entering Jinghong, there was a crazy and busy downhill to the city and then, all of a sudden we were at the Mekong river. The Mekong river! 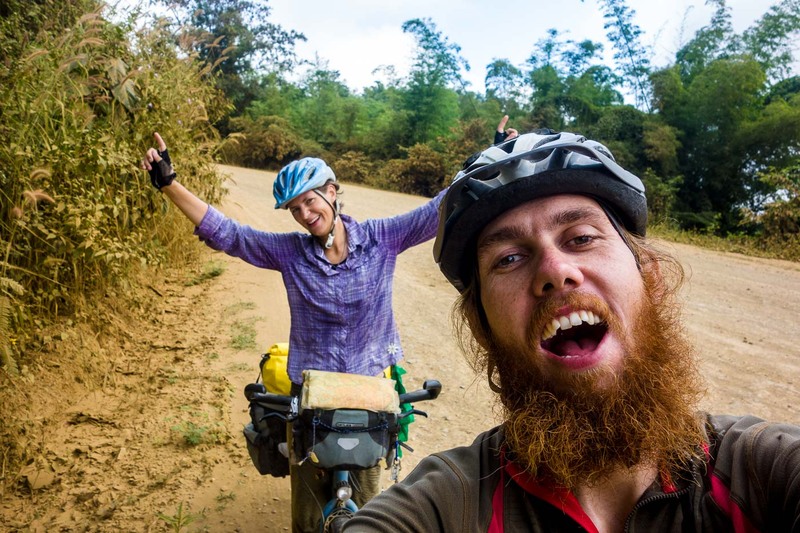 We had cycled all the way from the Netherlands to the Mekong river, a river we had both been to before, although not together. The river was beautiful and the sun was setting. We went in search for a small guesthouse and decided to relax for the day. The old road from Mengla to Mohan was very nice and we took our time on day 87 on our visa in the country. There were a few markets and small villages and we even got invited in for tea in one of the traditional villages which was a very nice experience. In this area of Yunnan there is a lot of rubber to be harvested and most of the motorbikes and small truck were actively working in the rubber business (which is quite a smelly business). Again when China focuses on one crop they do it well with many rubber trees to be harvested of rubber. China is an amazing country and we have been very happy with our time in this incredible country. Some things are very easy, but some things are very hard and difficult too. In general it has been easy to find food, especially oats for breakfast. People have been friendly and easygoing, although communication has been complicated sometimes. Roads have been good and traffic has been quite flexible with the Chinese being used to all different kinds of vehicles on the road. China is a rapid developing country and things can be very arranged and organised. On the other hand, we have never seen as much manual labor as we have seen in China. People working in the fields, on the roads, in factories, building houses. Very often things are being done manually. Also customs are different and the protection of land and water seems less of a priority. We have seen sick animals being disposed of in rivers, toilets flowing straight into rivers, land being over cultivated, land being herded until nothing is left but just dirt. Conservation and keeping the land fertile and healthy is a real issue. As well as keeping rivers flowing, we have seen too many dry and dead rivers. A saying we have uttered often is ‘dam the dam’. There are too many dams and I don’t think anybody knows what will be the long term impact of these dams and the interruption if the water system. Mind boggling, interesting, all the different types of people, the political underlinings and the International powers in which China is intermingled. internet safety and accessibility and a total different way of looking at the world. A lot of things to learn in a country as China. 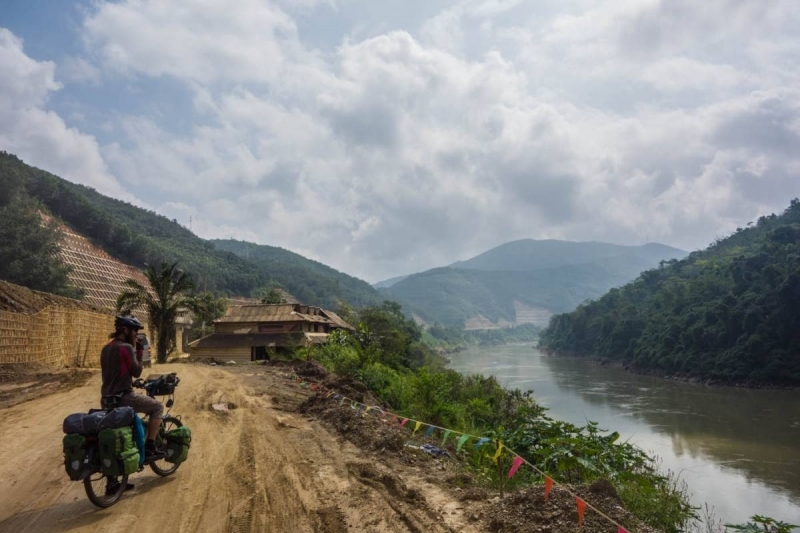 Hi guys, congrats on reaching the Mekong River! Keep pedaling!